The American Heritage Dictionary says that one meaning for the word extortion is “the criminal offense of using one’s official position or powers to obtain property, funds, or patronage to which one is not entitled.” It can also mean “the exaction of an exorbitant price.” No nationally known and respected political pundits are using that word to describe the political maneuvering that the Republicans are using to get the Democrats to agree to some harsh budget cuts. One or two radical bloggers who are jealous of the media attention given to the nobility of journalism, such as Bart the Bright, might bandy that word about recklessly in the hopes of landing a guest expert gig on a fair and balanced political TV debate program, but such rogues would also be prone to be card carrying members of the Associated Secret Society of Konspiracy Investigation Scholars and Students (You figure out their acronym) and the transparency of their grandstanding attempt would be apparent. The National Lampoon magazine cover that depicted a cowering dog with a gun aimed at his head had the headline: “Buy this magazine or we’ll shoot the dog!” That was a funny example of extortion but to use that word with regard to what the Republicans are doing is reprehensible. Is the military action against Libya listed as an active “war”? In all the excitement of the Arab Spring, we’ve kinda lost track of the exact count. Is it two or thee active wars? The Scientists have learned how to manipulate the media to their own advantage by using polar bears (Ursis Maritimus) to extort alarmist reactions from the journalists and now they are doubling down with a crazy story about cell phones causing sterility in human males. Really? “Don’t worry, baby, we won’t need a condom because we are protected by my constant cell phone use!”? Recently Karl Rove was a guest on Shaun Hannity’s radio program and when he was asked to evaluate all the Republicans trying to become their party’s next Presidential candidate, he forgot JEB Bush. Rove has worked for the Bush family since 1973 and he forgot JEB. How come journalists think Rove is a master of political strategy if he can forget JEB? . . . Say, you don’t think that was what the real political pundits call a “ploy,” do ya? 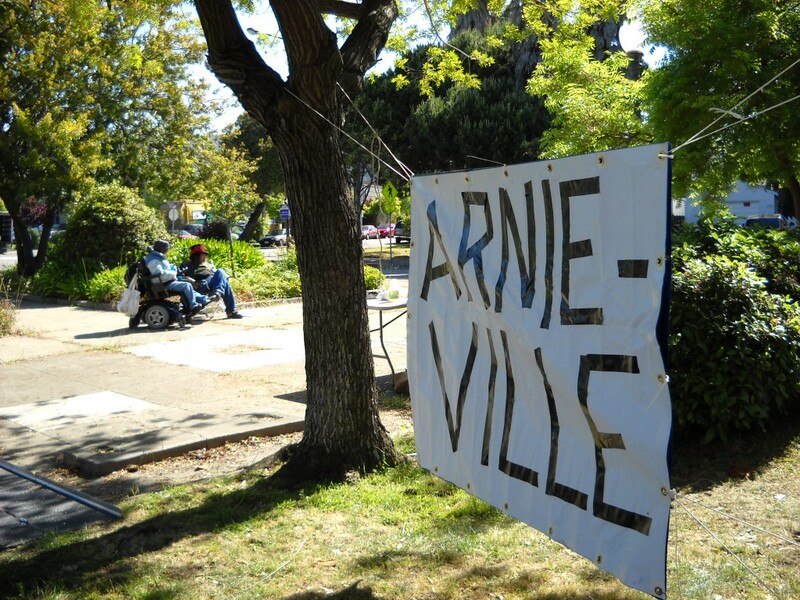 As the 2011 anniversary of D-Day approaches, the USA’s population of homeless is growing even as the number of empty homes that have been foreclosed increases rapidly. When President Obama said that the bombing of Libya to protect its citizens from a ruthless leader wouldn’t last for days or weeks, was he trying to say that he knew then that it would take months? If the part of the Constitution that says that Congress must vote to approve any new wars is obsolete, what other parts of that document are no longer viable? What ever happened to the news reports from the folks who started releasing information about radiation levels in the USA following the nuclear disaster in Japan? Would it be accurate to make a snide reference to “Gone With The Wind,” if the prevailing weather patterns might actually be increasing the amount of atomic fallout? Speaking of the all time greatest movies, has any political pundit pointed out the window of opportunity for a sequel to “The Blob”? The monster is flown to the artic and put in a de facto state of suspended animation. The victims agree that they will have no worries “as long as the Artic stays cold.” This columnist has been told that there is at least one palm tree living (in retirement?) in Paris (France, not Texas). The residual good will generated by the American led efforts to liberate Europe in WWII, is rapidly diminishing. Could it be compared to a melting snowman? Are America’s claims to being “the Good Guys” perceived in The Hague much like the spectacle of an old woman traipsing down Main Street in scanty attire? Wouldn’t being a paid staff member of an American news organization stationed in The Hague be an example of a sinecure? (Note: being a lazy journalist requires doing some work; doing none at all disqualifies a person from competing in any lazy journalism competition.) Was using a story that warned an American that he would be arrested if he showed up in Switzerland for a speaking engagement an example of journalism or a tip-off? What is President Obama’s status as far as a visit to The Hague is concerned? If you don’t know, then we rest our case. The American TV program “Boston Legal” used to feature some eloquent oratory that questioned the wisdom of America’s invasion of Iraq. What ever happened to that program? We liked the traditional “balcony time” closing sequences. On Memorial Day, the morning shift DJ on KALX threw an excerpt from President St. Ronald Reagan’s first Inaugural Address into the mix. He thoroughly denounced deficit spending before he started doing just that. The Republicans made fun of Senator John Kerry for “flip-flopping.” It’s only bad when a Democrat does it. Double standards can be so convenient. Life is so much easier when your theology is extrapolated from the novels of Ayn S. Rand. 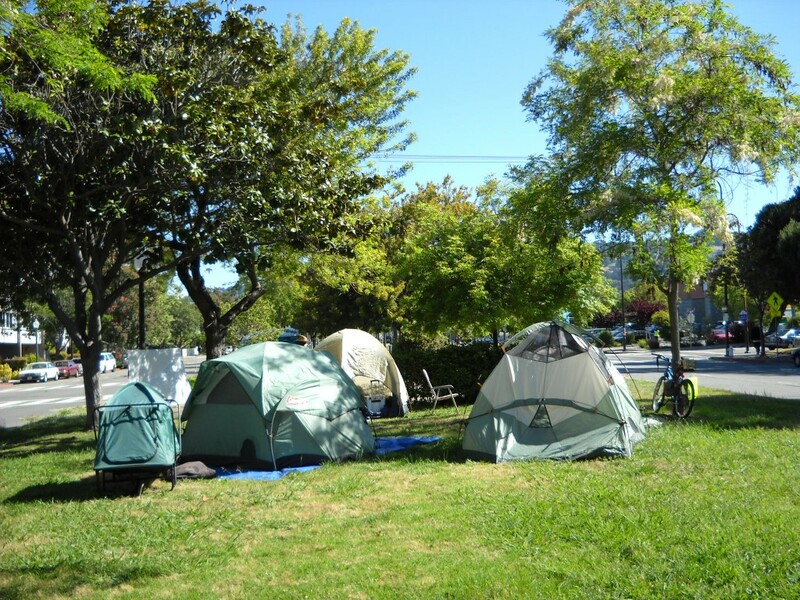 On Thursday, June 2, 2011, liberal talk show host Mike Malloy was aghast at the fact that folks from the Food Not Bombs organization had been arrested in Orland Florida for feeding the homeless. To him, there was a massive amount of irony involved in compassionate conservative Christians passing the law that was broken. Malloy has made references to George Orwell’s novel, 1984, but he has obviously failed to master the basic concept of double think. Mike, baby, when ya going to learn? If thine enemy strikes thee, turn the other cheek . . . then commit war crimes! Ayn S. Rand, in Atlas Shrugged (was Atlas a nihilist? ), wrote: “Happiness is possible only to a rational man, the man who desires nothing but rational goals, seeks nothing but rational values and finds his joy in nothing but rational actions.” Didn’t Capt. Queeg use logic to prove conclusively that there was another key? If you don’t think that arresting people who think they are Jesus doing the loaves and fishes routine isn’t a rational move to protect the public interest, then there’s no hope for you. Hunger is eternal. Is there a final solution to the problem of hungry homeless people? Isn’t removing the symptoms (from view) the same as curing the disease? Now the disk jockey will play: “Faithful Forever,” “I Poured My Heart into a Song,” “Over the Rainbow,” and “Wishing” (all of which were nominated for the Best Song Oscar™ in 1939). We have to go use the time machine to buy some Tono-Bungay. Have a “Fred C. Dobbs don’t say nothin’ he don’t mean” type week. 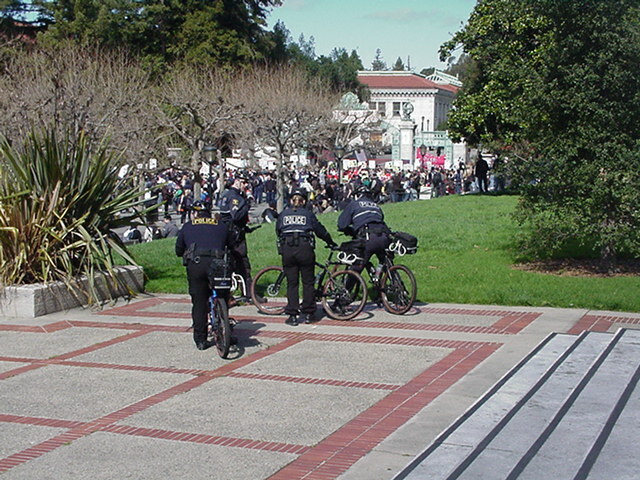 In Berkeley, police watch the students at the Sather Gate on the UCB campus, protest budget cuts. 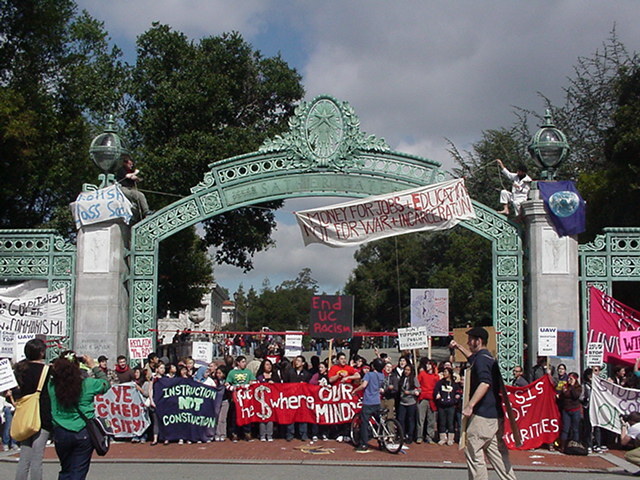 Photos of the students at Sather Gate on the University of California Berkeley campus have become an comon news media icon of Thursday’s protests.